Unlike the Kenmore 117s which were made by White, the majority of the 158s come from Maruzen, Japan with a few heralding from Taiwan. In general, the build quality of the 158s is quite high--especially by today's standards--but these machines have noticeably more slop than the older precision built 117s or even a Singer 237--a more basic but comparable zigzag model manufactured circa 1968-72. More on the 237 in a future review. Kenmore machines, along with many other imported clones, continually pushed the boundaries in terms of features offered on domestic machines while maintaining an acceptable (by vintage standards) level of quality. This really forced Singer's hand, putting them on the defensive, as features like stretch stitches weren't even offered in their product line. This was the classic battle between quality vs. quantity or what I've affectionately dubbed the "Clone Wars". We all know who came out on top. Singer's quality was compromised and many other sewing machine manufacturers were either priced out or forced to merge into new entities. For instance, the Singer Company today, is actually part of SVP Worldwide which owns the Singer, Viking and Pfaff brands. I'm half joking here, but oddly enough, sometimes, slop can be a good thing. Precision built machines can really struggle when stored in cold temperatures. The chill causes bushings to contract and sometimes, the tolerance is so small, your machine just might end up turning much slower or freeze up altogether. Featherweights are notorious for this. That's one of the reasons you might notice that your machine takes a while to warm up when starting cold. Couple that with years of hardened varnish from sewing machine oil and you have a recipe for a frozen machine! In my experience, it takes a heck of a lot more varnish to freeze a Kenmore stiff in comparison to precision built Berninas or Singers. The 1316 is a front loading, belt driven, oscillating hook machine. It's familiar design is very reminiscent of the previously reviewed 158.1040, featuring a similar nose shape, presser foot pressure control, upper tension and stitch dials. Even the brain under the lid is nearly identical! Despite these similarities, this full-sized machine doesn't feel quite as refined as its portable counterpart--partly due to the plastic carrying case it sits in and perhaps partly because the 1040 was released a year later and possibly benefited from refinements in the design. Regardless of the reason, I'm not a huge fan of these plastic bases as they don't have nearly enough heft to keep the machines they house in place when sewing at higher speeds. The 1316 sports an external 1 amp motor and easily breaks 1100 stitches a minute, topping out at nearly 1200--close to the threshold of what a domestic oscillating hook can handle. Impressive, but by all accounts impractical because if left unsecured, the machine will literally slide across the table and the ensuing racket will leave you with a ringing headache! My only recourse was to place a sheet of no slip shelf liner between the table and the machine base which offered some stability and much needed noise reduction. This is one loud machine! A cabinet, of course, should largely solve the vibration issue. However, if you do look for a cabinet, be aware that Kenmores have rectangular bases and do not fit in Singer style cabinets which have rounded cutouts. The same applies in reverse. The 1316 utilizes the standard 3 feed dog configuration and a convenient, extra high presser foot lift commonly found in vintage Kenmores. While zigzag capable, it has a fixed center needle position but unlike some of its later full sized brethren, does not feature a quick change needle plate. This is a good, practical set of stitches ideal for garment construction. If you're looking for more patterns, there are quite a few 158s with large built-in cam stacks or that accept single and double cams to open up your decorative options. Stitch length is controlled by the upper dial and stitch width is adjusted with the lower one. The knobs themselves are made of sturdy plastic but sit quite loose in the machine. Due to the way they are marked, it is nearly impossible to precisely dial in your stitch length and width unless you max it out in either direction. I do prefer the push button reverse found at the base of the machine over the more typical levers and nobs often found on other machines. The feed dogs are drop-able via a switch just under the stitch width dial. The stitch quality is quite good, and while you typically need to fiddle a little bit with upper tension when switching from straight stitch to a wide zigzag, I felt that this machine needed substantially more tension adjustment than usual. Nothing sewing a sample won't fix. You are testing your fabric samples before you work on your projects, right? The hand wheel on the 1316 turns much more freely than some of the later 158s that utilize a double belted pulley system. The acceleration curve on this machine is pretty steep and takes a little getting used to. Switching over to a modern electronic foot pedal will give you more control. Peeking under the machine reveals an odd curiosity. A five sided bolt! Huh? As far as I can tell, these are only found on Kenmores and likely part of an effort to promote proprietary tools. As you can probably tell, I'm not nearly as excited about this machine as some of the others I've reviewed. As a self-professed connoisseur of vintage sewing machines, I'm always looking for that special something that makes the machine unique and truly stand out. The 158.1040 does just that--capable of everything this machine does but in a portable package with the extra cuteness factor. That being said, I don't want you to leave thinking that this isn't a quality machine, the 158 line of Kenmores are respectable machines that offer a nice blend between rich features and good build quality. Should you stumble upon one of these, you'll find the 1316 is a capable workhorse that will get the job done. Questions? Comments? 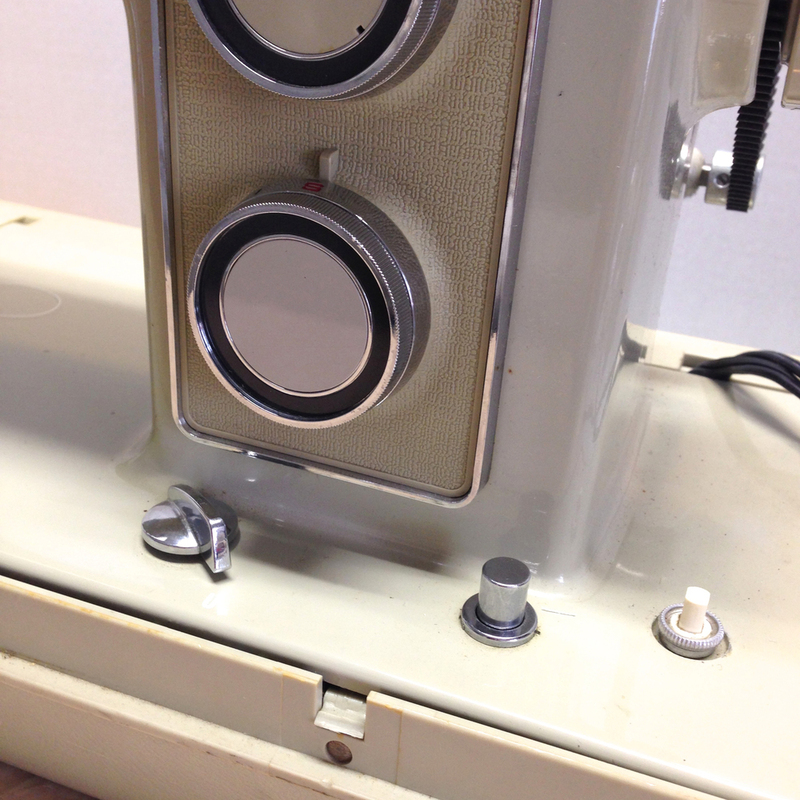 Have you sewn with a vintage Kenmore?